Hiya there. Should we talk about the fact that I haven't posted in a month? Nah, you get it. Work, exhaustion, being an adult...the blogging thing has just kind of fallen by the wayside for me, and I've still been questioning if I feel fulfilled by it. So, I took another short break, and I'm glad I did. I'm feeling re-energized lately, though, so I want to get back into it. Before I really do, I thought it made sense to share these outfits that have been sitting on my computer for a while. While I haven't been posting, I've still been taking photos regularly and posting them on Instagram. It's still part of my regular routine, I just haven't been taking the time to edit them and write about them. So please enjoy these Instagram outfits (they're some of my favorites), and look out for some actual outfit posts soon. Hopefully. I think. We'll see. You are the cutest! I totally relate to feeling burnt out by blogging. I went through that recently but now that fall is here I feel energized again. I can't wait to see your posts! So many great lewks and textures and murals here! I especially love everything about that first look (sunnies + mint green door + that dress!) 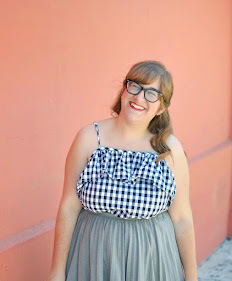 and that purple gingham skirt I neeeed. Glad if you weren't posting you were still documenting outfits! Taking time seem critical- and if you don't have affiliate deadlines/aren't doing this for a job, I think the blog should be flexible for your needs. That said, I love your outfits and this was a fun way to see a bunch at once and get a better feel for your style overall now. What was your style ID btw? I know that feeling; sometimes I don't have the energy to write up an entire blog post and it's faster to post a few shots to Instagram. It's good to take breaks from time to time. I really like the blue striped peter pan collar tank with yellow skirt; blue and yellow is one of my favorite color combos lately!